My calendar tells me the year is still 2014, but the marketing team behind Culturelle Kids is clearly situated 40 years ago or more. Here we have what appears to be an exceptional childrens’ chewable pill to reduce tummy discomfort, and all Culturelle can think is that kids must only want moms. Why are dads constantly being told through marketing messages that they’re less than moms? Today, the roles have never been more equal, great strides have been made in various industries and professions with relation to pay, and parents often share duties past generations wouldn’t have dared. So why must dads continue to hear that they’re second fiddle to mom’s better judgment and instincts? Moms are no more intelligent than dads, and dads are no more clueless than moms. No matter if it’s an animal or a human being, parental instinct is a strong force, and even with lack of knowledge, adults learn as they go. Yet Culturelle perpetuates the sad and ugly stereotype from a bygone era that dads can’t handle it and thus, kids must want mom first, making dad feel like a secondary, if not useless, parent. 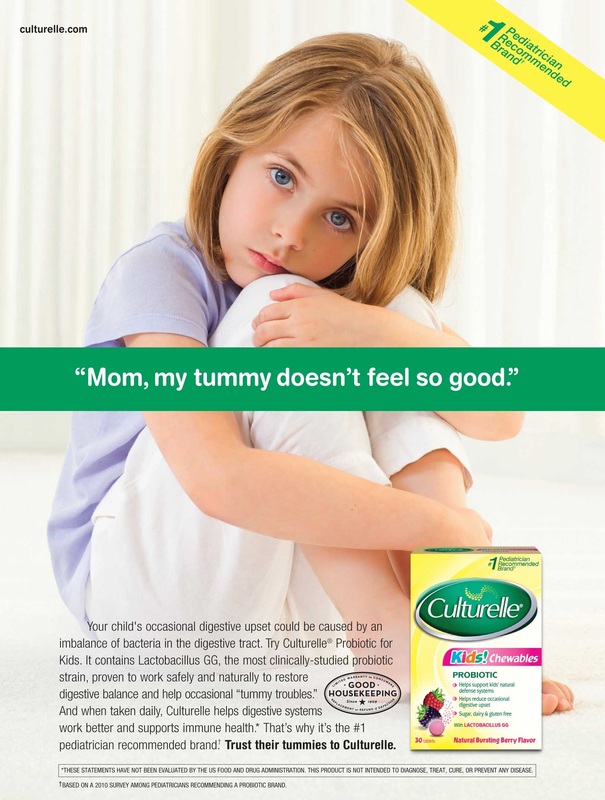 If Culturelle Kids is indeed the #1 pediatrician recommended probiotic – and some of those pediatricians must be dads – then who are their kids calling when they have a sick tummy? Culturelle, we hope you can consider all of your customers when crafting your marketing materials. Dads take care of kids, too. Our culture is different now – and you should know better, because it’s part of your name. I’ve had a lot of ideas over the years. Okay, okay, confession: that story and pun was made up. But even though a pun may fit and might sometimes even seem too good to pass up, it doesn’t make it right. We love the play on words if it were a moms-only site, and bear with us – we’re not comparing a term like white trash to Motherlode – we’re only using an analogy to make a point. Even its url is listed in web language as http://parenting.blogs.nytimes.com/. Note the first word used is parenting, as in moms and dads. Obviously, families include dads, and with a title like Motherlode, how can it possibly make dads feel welcome, or even make them want to check out the site? Not surprisingly, the writing you’ll find there is fantastic – very fit to print. After all, this is the New York Times, otherwise known as media royalty. Everyone in the newspaper world wants to be like the New York Times, winners of a record 114 Pulitzer Prizes. It has been the standard in journalism for 163 years, and of course, it is a wonderful act to follow. Hardly anyone should ever question what they do because they’re as good as it gets, right? In that vein, does it not seem like everyone’s giving the Motherlode name – surely a discriminatory one – a free pass, just because it’s the New York Times? As readers, do we even recognize its name’s chauvinistic tone, or have we become immune to the exclusion of dad in its title? In the last 30 days, I counted just one Motherlode news story directed explicitly at dads and fatherly issues (while the “Deployment Diary” is excellent and referred to dad a lot, it’s not a dad-specific issue). And I only noticed three male writers. So, if “families” is its goal, it’s missing the mark in more ways than title alone. NBC News, another highly reputable media source, became all the wiser when it suddenly renamed its TODAY Moms to TODAY Parents in June, a far more inclusionary and correct name for the news affecting, well, parents. As it stands now, the New York Times would rather use the word mother as a generic term for parent, like Kleenex is for facial tissue. Do you ever ask someone, can you please hand me a Puffs? In the same way, let’s not let this attitude lead to a society where office forms simply state “mother,” but we have to assume the office wants us to list both the mom’s and dad’s name. Dads know this oft-forgotten tale all too often. After all, it was only two generations or so ago that dads were not even allowed in the delivery room. While that practice has changed for the better, let’s be honest, doctors still mostly speak only to moms at child well checks as if they’re the lead parent, making dad to feel like an assistant at best, nonexistent at worst. Being one of the leaders in journalism means setting an example and acting like it, from top to bottom, side to side, and tiny little bit to Motherlode. But there’s just one small problem with that description, because if Hilton’s world is truly reality, then only about 7 percent of dads are traveling. Among its team of 15 bloggers writing about so-called “real families and their travels,” it’s only authored by one dad. If that title doesn’t strike a nerve with moms and dads alike, it should. In Hilton’s realism, the word mom has become the generic term for parent, strong enough to stamp out the word dad from even existing. We have no problem with real moms giving real travel tips. If moms want to give other moms, or even dads, some tips or advice, have at it. Both genders can benefit from a motherly perspective. However, when the site’s focus is to offer experiences about real families, and pair it with a blog title that outright excludes dads, that’s when Hilton is sorely missing the mark. Hilton may want to have a conversation with NBC News and The Today Show, where this past summer its online “TODAY Moms” web section was replaced with the less offensive and more inclusive, if not more modern, “TODAY Parents.” Its rationale is outstanding, but still, why did it take so long to make the change? Back in the 1950s and 60s, the show employed “Today Girls” (no, they didn’t use all-caps then), who discussed fashion and lifestyle, reported the weather, and covered lighter-fare stories. The last woman to hold that position was Barbara Walters, who said nobody would take a woman seriously reporting hard news back then. Yet, here we are some 50-60 years later, and dads are not taken as serious parents by Hilton. When will Hilton make the easy fix that TODAY wisely did? Only Hilton can answer that. In the meantime, the reality is, there are plenty of other hotel chains where dads and moms can take their business until Hilton realizes that dads like to voyage, too. 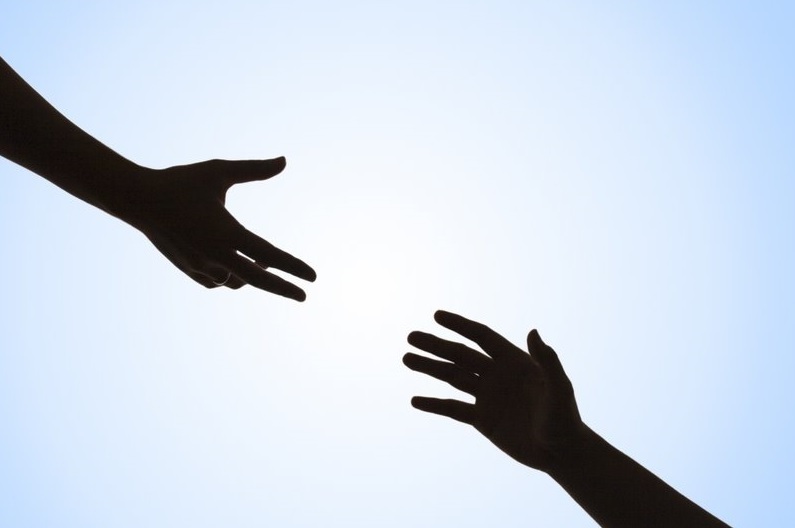 As far as we can tell, there’s not a single entity or individual on the Internet devoted to exploring and analyzing how businesses market their products and services to fathers. 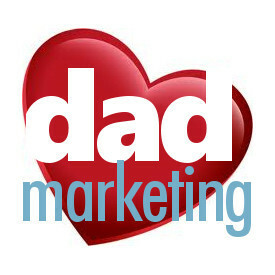 It wasn’t until we unveiled dadmarketing.com on December 14, 2013, that history was made. Like with any new venture, there was some uncertainty about the amount of writing material, how readers might respond, and just what we might achieve. There was never any question as to its need and relevancy. Dads remain left behind in so many facets of life, and most men don’t realize this until they become fathers themselves. 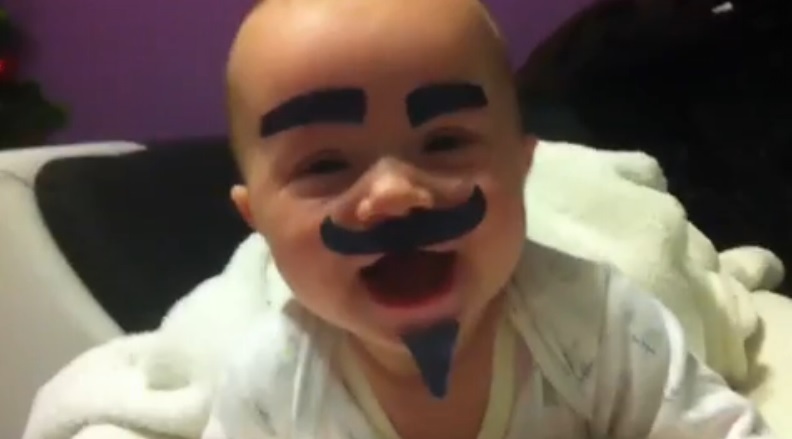 Why are stay-at-home dads not taken seriously by media and society? Why can’t marketers simply include dads in their messages and advertisements? Why must old-fashioned, anti-dad slogans remain in a society that demands equality? Does it really matter which gender predominantly shops for and feeds children? If kids eventually grow up and leave the nest, at what point do dads become instantly capable of fending for themselves in a store, or in a kitchen? Questions matter, and we’ll keep asking them. It’s part of our mission, our duty, and our purpose. So are all of your needs, and we plan to keep on listening to them, which help to keep us on target. We’re smack in the middle of the holiday season, where dads and moms inevitably take part in various parties, some easier to stomach than others. But can you dads imagine attending a party where no one spoke to you the entire time? Marketers do this all the time with word choices they make, and it’s more than disturbing. 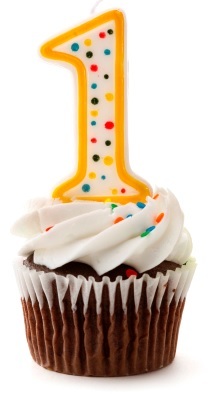 One year is in the books, and as long as dads roam the earth, we figure we have many more to go. Thanks to all of you for your unwavering support, tireless goodwill and unmatched appreciation. Our continued growth depends on feedback, so please keep it coming. Here’s to the past year, and the years ahead! 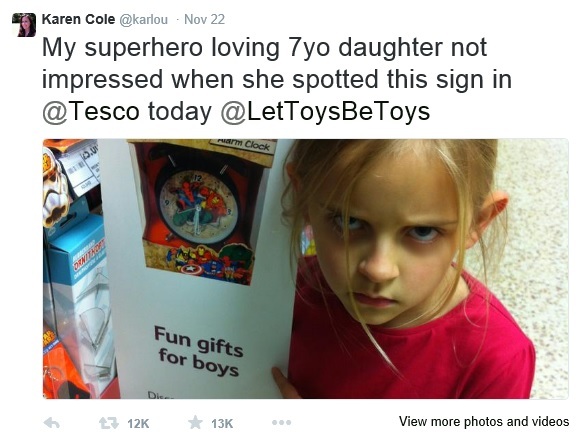 A few days ago we retweeted a story about this young girl who fought back against a sexist sign, and ultimately claimed victory as the sign was removed. Her modest, ingenious and charming complaint challenged the higher beings at a store in England, and executives listened. 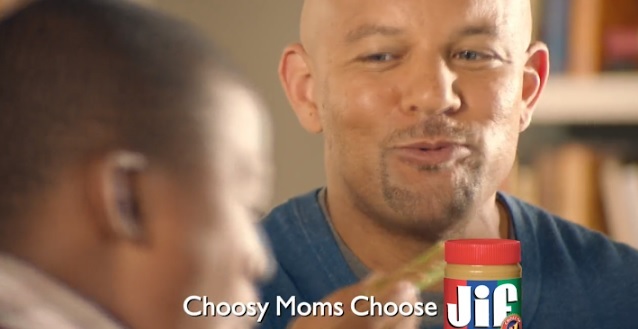 Her protest got us thinking about the foolishness of Jif’s tagline, Choosy Moms Choose Jif. If a young girl can get the attention of a large retailer, why can’t Jif take inventory of its own sexist practice? Doesn’t their parent company, Smucker’s, want to market their goods to all and be perceived as a modern, progressive, with-the-times business? What does their four-word marketing message say to households without a mom present? We’ve discussed some of Jif’s plight before, and again, and yet again. Jif’s stale slogan was created decades ago, during a bygone era when mothers generally handled cooking, cleaning and household shopping. Jif is essentially hanging that chore on mom in present day, and indirectly, the cooking and cleaning, too. Doesn’t Jif’s approach remind you a little of this? Yes, even as the year 2015 looms, an embarrassing, inane catchphrase has long passed the old-fashioned phase; in today’s world, the saying looks downright irrational. So, in theory, little has changed and her fight could still go on. Jif, on the other hand, is so stuck in time and dead set in its ways that we know there’s still a long way to go toward making things right. Jif is indeed a tough peanut to crack (they won’t even respond to us, or acknowledge us), but we know at least one 7-year-old who could bring the entire empire to its knees. What do you say, Maggie?